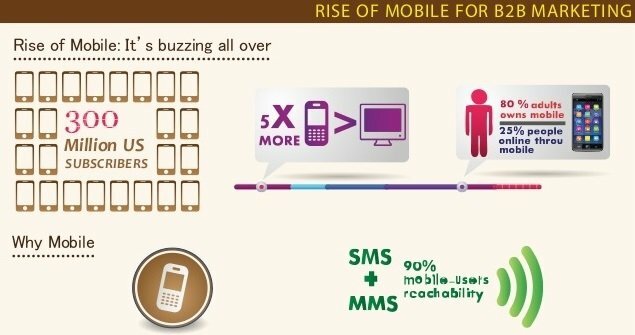 Currently people are spending more time on their mobile phones than ever before. This new trend has been boosted by some excellent mobile technologies like smartphones, tablets, SEO and mobile sites. Therefore, understanding these mobile customers and their preferences has become an imperative for B2B marketers. Mobile phones have touched different areas of our lives, and there is this huge opportunity for B2B marketers as they play a pivotal role in their business growth. Smartphones have become so ubiquitous that they are poised to reshape industries, transform businesses and enrich lives. The ubiquity and amazing usefulness of this technology is hard to ignore and if you want to employ mobile marketing as a part of your B2B growth strategy, then it’s the perfect time to start NOW! !